THE Downpatrick and County Down Railway (DCDR) is celebrating after collecting a very prestigous trophy last weekend. It was praised for its community involvement and work in towards creating a tourism attraction unique in Ireland. John Wilson, Downpatrick and County Down Railway Director, Down District Council Vice Chairperson, Councillor Maria McCarthy, Robert Gardiner, DCDR Chairman, and Neil Hamilton DCDR Curator pictured at the Pride of Place awards ceremony in Limerick. On Saturday 3 November, representatives from the DCDR and Down District Council traveled to Limerick to attend the 2012 All Island IPB Pride of Place Awards at a gala awards ceremony at Thomond Park. where the new sponsor IPB, joined Deputy Jan O’Sullivan, Minister of State at the Department of Environment, Community and Local Government to congratulate all the successful groups from across the island. From the many entries, the DCDR won through to being runners-up in the Cultural Tourism section. Railway Chairman Robert Gardiner said: “This was the first time we have been entered in a competition like this and the competition was very tough. The winners in our category, Cavan Fleadh Cheoile, were similar to the level of a West Belfast festival and deserved winners. It was a fantastic experience for our organisation. “We are the only fully working heritage railway in Ireland and are quite unique in that respect. It was a real pleasure to be up there competing with the best across Ireland. We learned what the wow factor was all about. “With our new railway museum centre, our visitor numbers have increased well and there is a constant footfall from mid-week visits to families coming at the weekend. “I would like to thank Damien Brannigan, Community Relations Officer with Down District Council, for all his help for his nomination and in making this happen for us. “Our thoughts today are for our past Chairman, the late Michael Collins, who gave so much to the DCDR. It was much his efforts that brought the railway society forward to what it is today and all of our members wish to dedicate this award to his memory. 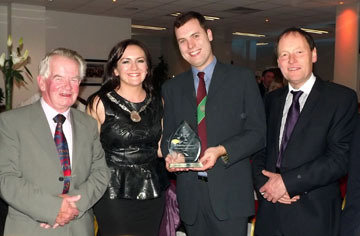 Robert Gardiner, second right, Downpatrick and County Down Railway Chairman, receives the runner-up prize for the Pride of Place awards for the Tourism category. Included are Tom Dowling, Chairman Pride of Place Committee, Ronan Foley, Chief Executive IPB Insurance, Neil Hamilton, Christopher Moran, Chairman Co-operation Ireland, Cllr Jerome Scanlon, Cathaoirleach Limerick County Council, and Gerry McLoughlin, Mayor of Limerick. and the Downpatrick and County Down Railway. 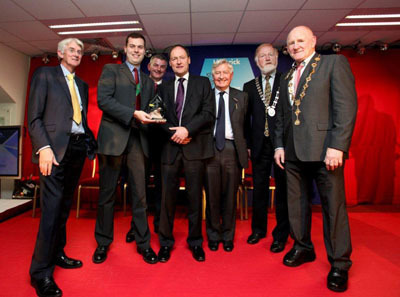 Down District Council Chairperson Councillor Mickey Coogan has expressed his delight at the recognition bestowed upon the Downpatrick and County Down Railway at the Pride of Place Awards 2012. Councillor Coogan extended his congratulations to all the volunteers of the DCDR adding: “It is a fantastic achievement for the members and volunteers who have given up so much of their time for almost 30 years, not only to preserve our railway heritage, but also to promote one of Ireland’s only remaining operational railway attractions. Down District Council Vice Chairperson who attended the ceremony, said: “This annual competition recognises and celebrates invaluable contributions that community partnerships make. Unlike other competitions, the Pride of Place Awards specifically acknowledge community involvement, the promotion of heritage and local people who shape their area. “The Downpatrick and Co Down Railway perfectly fulfill the criteria for this. They are a group of dedicated volunteers who have worked painstakingly to rebuild the railway and continue to work tirelessly to promote this wonderful tourist facility. I am so pleased the Railway has been acknowledged with this prestigious honour, particularly given some very stiff competition on the night. “This recognition will allow for the further promotion of the tourist potential of the Railway and the resulting employment and business opportunities that this brings. “It is also very fitting that the Railway should be acknowledged in such a way given the untimely and sudden death of their former Chairman Michael Collins. There is no doubt that this huge loss is felt by each of the volunteers. I am certain however, that Michael’s legacy will live on and his uncompleted works and goals will provide a pathway for the future of the railway in Down District,” added Councillor McCarthy. More that 400 representatives from practically every county in Ireland were treated to music from Crystal Swing before the winners of the tenth consecutive annual competition were revealed. They were announced by Will Leahy, 2FM Presenter who acted as compere for the evening. Minister O’Sullivan along with Co-operation Ireland Chairman Christopher Moran, Pride of Place Committee Chairman Tom Dowling and IPB Chief Executive Ronan Foley, presented the groups with their awards. The All-Island Pride of Place Competition recognises and celebrates the vital contributions that community partnerships make to society. The focus is on people coming together to shape, change and enjoy all that is good about their local area. It differs from other similar projects in that they specifically recognise the involvement of the local community in all aspects of rural and urban regeneration including, promoting social cohesion, involvement in planning, the promotion of heritage and environmental awareness. Tom Dowling, Chairman of Pride of Place congratulated all the participants and he acknowledged that this year’s competition attracted the highest number of nominations since the competition commenced. He said: “The reason the communities are here tonight is because their local authority believes in them and recognises that they have huge pride in their place”.